~ Local Shops and Pubs etc. 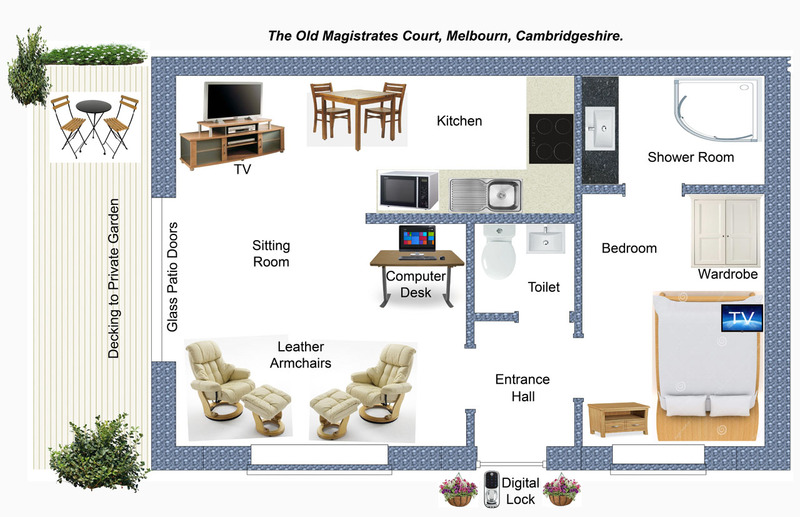 “The Old Magistrates Court” – Melbourn, Cambridgeshire. 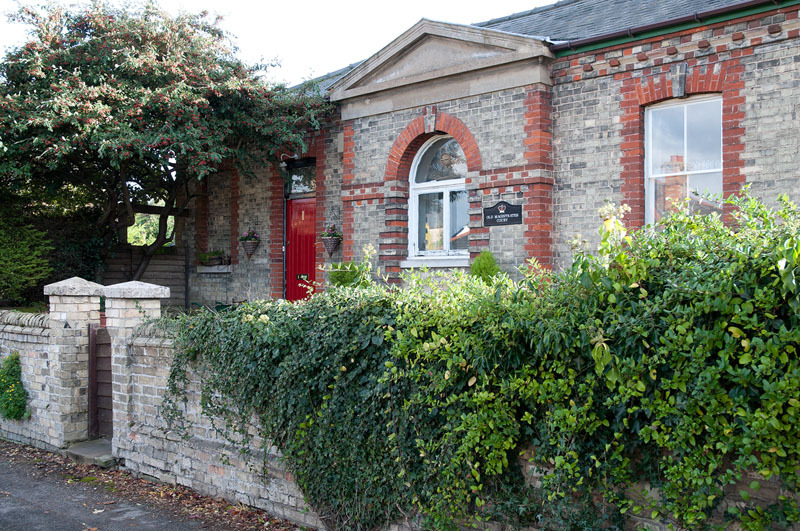 This former Magistrates Court and Police Station, is situated right in the centre of the village of Melbourn but “our lane” is very quiet, private and peaceful. Shops, pubs and restaurants are within three or four minutes walk. There are regular buses and the mainline railway station at Meldreth is just 12 minutes walk away where you can board trains for Cambridge and London. Do not hesitate to contact Les or Christine if you need more information. We look forward to welcoming you. Stay for two or more nights and get 10% off the normal rate but only when booked directly through our website (not to be used with any other offer or Promo Code). You will have exclusive use of our apartment style “Annex” and this “plan view” gives you some idea of the layout. Come and go as you please with your own private entrance. Total size is approximately 40sqM. (8m x 5m). The rooms are to scale but the contents are not although they are reasonably accurate. Breakfast is included. Use our on-line booking system to check availability. There are no booking fees and no charges for credit card payments. Please book directly with us via our website as it saves us commission charges. Simply choose a “Check in Date” and click on “search”. Follow the instructions or if you prefer, contact us directly. You will love it here, space to relax and for the business person all the facilities you could need. We really do care about your comfort and privacy. A lot of our bookings are made through Booking.com and thanks to our guests who gave us wonderful reviews we have been awarded (in January 2016, 2017 and again in 2018) the highest rating of any establishment in the area with an average score in each of those years of 9.6 out of 10. Something to be very proud of. Good base for my stay for a couple of nights to visit my daughters locally. Quiet setting, comfy and spacious with lots of little extra touches. Les really cares about his guests and their comfort. On the first morning, knowing I was off to visit family, Les presented me with half a dozen warm pastries to take with me. Lovely touches such as home roasted coffee and freshly squeezed orange juice left in the apartment. Huge continental breakfast with enough to take away for lunch with Les’ blessing. Welcome sun terrace and garden which did not feel overlooked. Good sized desk and wifi ideal for the business traveller. The best place I have stayed ! Forget all the corporate hotels if you are in the Cambridge area you would be mad to overlook this place. This is a fantastic place to stay with a really original breakfast (inc. home smoked salmon!) and outdoor seating overlooking a beautiful garden. Very friendly, spacious and comfortable. A superbly equipped annex, which is well laid out and every need catered for. Comfortable bed and sitting room chairs. I felt very much at home. Les is a genial host , for whom nothing is too much trouble and breakfast was a real treat, especially the smoked salmon. Thank you. We stayed at the Old Magistrate’s Court over Christmas 2017. No more could have been done to make us welcome and out stay enjoyable. My wife is coeliac and so has to avoid gluten. Les was kind enough to buy a separate toaster and to provide gluten free bread and other products. As a further example of hospitality, when it snowed Les cleared the snow from our car and made sure that our exit was completed safely. We recommend The Old Magistrate’s Court whole-heartedly. 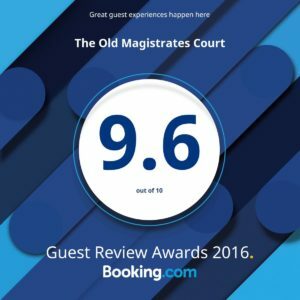 We had a most enjoyable stay at the Old Magistrates Court B&B. Les is extremely hospitable and nothing is too much trouble for him. The apartment is beautifully appointed with separate lounge, kitchen, bedroom, bathroom and toilet, and it even has its own patio and garden. The apartment is stocked with virtually anything one could wish for, and then some more ! Clearly, considerable thought has gone into it. The breakfast passed all expectations and the home cured smoked salmon was delicious. It provided excellent value for money. We thoroughly recommend this B&B. What a lovely experience. Truely one of the most welcoming and generous B&Bs I have ever stayed in, and as a result it stands out for the level of service provided. The location is quiet and the accommodation more than generous; for example it was really great to have the well equipped kitchem with condiments so I could prepare a light supper for myself. My only regret is that as I was staying for work, I could not share the experience with my husband. I look forward to staying here again in the not too distant future. Les, Your smoked salmon is absolutely amazing!So many thanks. A lovely retreat, we were made to feel welcome straight away. The Annex is warm ,comfortable ,clean and has everything you need for your stay. Les was very helpful and nothing was to much trouble. the breakfast was beautifully presented and was a lovely start to the day. Fantastic place to stay. Will certainly be staying again. 5 star plus. We were spoilt rotten. Les your a marvel. Thank you so much. You really do provide a warm and hospitable service. The annex had everything we could need plus lots of those nice high tech gadgets! I stayed for only the one night, but would have been happy to stay for a month. Les makes you feel very welcome and the home from home is very comfortable, with everything you need for an enjoyable and stress free stay. Would be happy to recommend to anyone. I stayed at the Old Magistrate Court B&B for two nights. Les is an exceptional host, he even came to pick me up from the train station. The place is exceptional and it is spacious with a private garden. I highly recommend this place. Fantastic B&B. It would also work brilliantly for self catering as it is independent from Les’s house. Les has thought of every creature comfort, and more, with this B&B. From arriving, with helpful tips, to fresh croissants delivered for breakfast, this has been a memorable stay – we will return ! Next time we’ll have breakfast on the lovely private deck, weather permitting !! We received a warm welcome from Les on our arrival and soon fresh made cakes appeared to accompany a much needed cuppa after our journey. The accommodation and facilities are all excellent and the generous ‘hamper’ provides for all of your immediate needs. After a comfortable nights sleep and the use of the smart shower room Les appears with a basket of fresh rolls, croissants and pastries. A perfect base for anyone visiting the area and somewhere that we would highly recommend and hope to use again – if it isn’t booked up as this B & B will prove VERY popular.